How did you get into the profession of printing? As an art student in the 90s, I became interested in ways to output digitally created artwork. After reading Walter Benjamin’s 1936 essay, “The Work of Art in the Age of Mechanical Reproducibility”, I became fascinated by the potential of reaching a larger and more diverse audience through digital and mechanical reproduction. At that time, there was only one type of printer that came close to producing similar image quality of a traditionally exposed color photograph. That printer was the venerable IRIS inkjet printer, which had the unique advantage of the ability to make those prints on a large variety of art papers, including washi. Very few people had done the engineering necessary to convert these $126,000 complex and finicky pre-press proofing systems to produce fine art. One of those pioneers is a man named Jack Duganne who is the owner and master print maker at Duganne Ateliers in Santa Monica. After leaving graduate school and landing in Los Angeles I asked around about who was doing the best digital printmaking in Los Angeles and I was told a number of times that it was Jack Duganne. Because I could not otherwise afford to learn and use the technology I needed in order to produce my artwork I knocked on Jack’s door and asked him for a job. Jack is a great teacher and lovely human being and 15 years later and with much thanks to him here I am. What are some differences with printing on washi compared to other paper? Washi papers offer much more variety of texture, weight, tone and color as compared to other papers and especially to other fine art quality inkjet papers. Washi papers also tend to be much stronger than western cotton papers and like gampi for example, can remain strong as a very thin and translucent material. Lastly, do you have any advice or tips with printing on washi for people? Ideally when printing fine art and photography, custom profiling including sophisticated ink-limiting and linearisation should be performed for each ink/paper/resolution combination. When that is done, the maximum imaging potential of each paper is achieved. I use professional profiling hardware and software as well as a third party RIP to maximize print quality and accuracy. Short of the professional approach, I have a few tips for printing washi on a high quality inkjet printer such as offered by HP, Canon, and Epson. Generally, the brighter white the paper is, the better color and contrast you will be able to achieve. Ironically, the dominant inkjet printer technology is Japanese and I have never seen a washi printing preset in any print drivers. Perhaps that is because of the huge variety of hand and machine made washi papers available. The paper settings in your print driver among other things controls the amount of ink that is allowed to go onto the paper. Coated washi papers can accept more ink than uncoated papers, they will give the best results. Experiment with fine art paper settings when using coated washi paper. When using uncoated papers, I’ve found that picking a plain paper setting often works best. When an image doesn’t come out as brilliantly as we want sometimes the first instinct is to lay down more ink. Quite often we are overloading the paper giving us muddy looking prints. Better results may be obtained from laying down less ink. It started out as a project to create her wedding invitations, and escalated to more invitation requests from couples. Amy is now taking the time to work on her own art. She has been drawing all her life, and attended school for architecture. During a mission to find paper sources, she was led to us, and we have been big fans ever since the first time she brought in her work! Last week, Yuki and I were more than excited to be able to visit her enchanted studio. Take a look around! Toby Michel with some prints on Niyodo White. 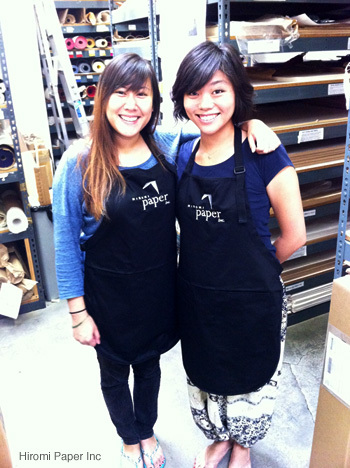 A couple of days ago, Yuki and I had the pleasure to visit the studio of Angeles Press, which was only a 5 minute car ride away from Hiromi Paper! We were immediately greeted with prints done on our paper such as Niyodo White, as pictured above, and on the KM-03 Surface Gampi White, which was deemed as a favorite, and can be seen below. Photography, editing, and printing by Mary Michel on KM-03. Angeles Press has been around for over 30 years and is now focusing in the digital field. Mary and Toby work intimately with clients on their projects to meet their every needs, whether it is for just a single print or editions. It was amazing to be able to experience how they transform images, some were even taken by smart phone’s, in to physical art work. We were able to work with them on printing with various Japanese and Bhutanese paper’s, which is just a sliver of what they are capable of printing on. Painting by Victoria Sutherland, printed on Asuka 150g 17″x22″. From Victoria Sutherland. Printed on HP-61 Okawara Small. Image taken by Trisha O’Keefe, “White Egret”. Print on top with an Epson paper, bottom with MM-23 Shirakabe. Thank you again for showing us around, Angeles Press! Celebrate Hiromi Paper’s 25th Anniversary with Us! Time: 6.30 p.m. to 8:30 p.m. Location: Hiromi Paper, Bergamot Station. 25 years ago Hiromi Paper opened to serve a connection between Japanese paper-makers and artists around the world. This year we will be celebrating our quarter century anniversary and we would love to have you join in on our festivities! An evening reception will take place right at Bergamot Station, where our retail store is located. We will also be joined by paper-makers from Kochi and Fukui, Japan. Stop by for some drinks, grub, and to mingle with fellow paper/art lovers and makers! There will also be a special 25% discount off all items in-store on the day of the reception party. Please RSVP by calling or emailing. Check out our new aprons, which we will be selling for $15.00! Contact us for more information. Author tpulpletPosted on August 16, 2013 Categories About Washi, Event, New Product, Sale, Updates, World of Washi Newsletter, Written by JoeyLeave a comment on Celebrate Hiromi Paper’s 25th Anniversary with Us! New York native artist Geraldine Neuwirth opened up her studio to us and shared some insightful words about the nature of her art. This certain piece is around the size of the average human height, measuring at 98″ x 68″. Her work is often framed, making the piece even larger in person, and this is how she would transport them from her studio to her exhibitions. Geraldine regularly showcases in California and New York, just this year she had a POP UP exhibition at 74 Market Street in LA, and the previous year she had a solo show at the Wendt-Gallery in New York. Geraldine not only works in large sizes, some of her smaller pieces are done on the Shojo-shi paper. These bold, dream-like and intricate shapes are done with an ink media, sometimes mixed with pastel, and often intermingled with more shapes added on by collage. The combination of shapes and colors are familiar to Geraldine such as one would be to a “language”. They come to her in their own form of vocabulary and speak to her through influences of the circus and theater. Growing up in New York, Geraldine was no stranger to the theater world, because her father had worked at the Shubert Theatre. One of her two daughters, Irene Neuwirth, is also well known in the business with her designer jewelry. Her works-in-progress are mounted on the wall as she studies them from afar sensing where to change certain shapes or colors for the final product. Even if a piece has entered the final stage, in the future it has a possibility of changing or being pulled apart to be used in other pieces. This is another set of mix media work done on our Mohachi 22″x22″. Geraldine often creates a number of pieces that fit together pleasantly, either by color, shape, or size, and show them in groups. She is also working on 3 dimensional constructions as well. Also, you may have noticed by now that Geraldine does not follow the shape of the paper. She likes to create life and energy at the borders, extending her art without limit. When asked she says, “why stop on paper?”. Another source of her inspiration comes from her transformation through the hardships and changes in her life. Her work is very personal, and the objects and colors call out to certain emotions differently for each individual audience member. Observing her work is really an experiential process, at times you even feel yourself falling into it. Thank you so much for allowing us to visit your studio, Geraldine! The last destination for our washi tour was Kyoto! It’s now off to Kochi for Yuki and I! A bit tired and wary from traveling long distances on the bullet train, but we were undoubtedly excited for this leg of our journey.